Abyaneh, also known as the Red Village because of its red soil and houses, is an ancient Iranian Village located at the foot of Karkas Mountain, 70 kilometers southeast of Kashan in Isfahan province. 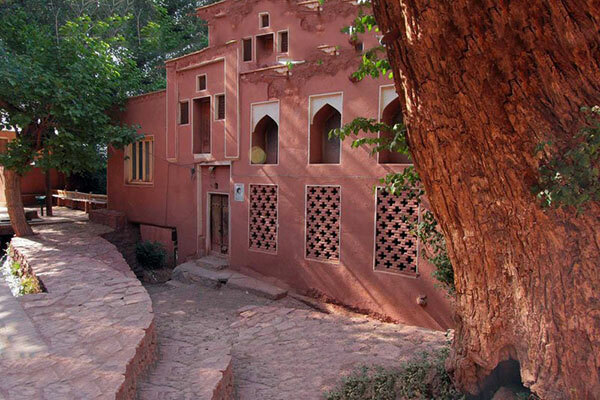 Abyaneh is a Village of living traditions, architectural styles (all in red clay) and probably one of the most interesting examples of human adaptation to nature. The Village is compact, with narrow and sloped lanes, and houses located on the slope as if placed on a stairway. The houses bear an ancient architectural style, featured by the use of clay as the construction material and latticed windows and wooden doors. Similar to Masouleh. The roofs of some houses are used to serve as the courtyard for other houses higher up on the slope. With a unique reddish hue, the Village is one of the oldest in Iran, attracting numerous native and foreign tourists year-round, especially during traditional feasts and ceremonies. The village has a long history which dates back to more than 2,000 years ago and been registered on Iran’s National Heritage List since 1975. The word Abyaneh, has been derived from the word “viona” meaning a willow grove. It’s been known an entrance to Iranian history as the locals are deeply committed to honoring their traditions. The language spoken by the literate people of Abyaneh is Parthian Pahlavi. The local clothing for example is in a style of great antiquity. The women’s traditional costume typically consists of a white long scarf (covering the shoulders and upper trunk) which has a colorful or floral pattern and an under-knee skirt or pleated pants. Almost all of the women in the village wear this costume, just like their ancestors. And this tradition makes Abyaneh even more special. When you go visit Abyaneh, you would notice that most of the population are rather old. It’s because the young generations prefer to migrate to bigger cities to have a better opportunity to make a life. The people of Abyaneh still keep the old traditions and wear their traditional clothes. Abyaneh is mainly watered by the River of Barzrud and has a cold climate. It enjoys numerous springs creating suitable conditions for agriculture. Seven qanats assist in the irrigation of the fields. The main agricultural products generated in the region are wheat, barley, potatoes and fruit such as apples, pears and apricots. As of late, carpet weaving has also become popular in the Village. In addition to a Zoroastrian fire temple dating back to the Sassanid period, there are also three castles in the Village, a restaurant, a pilgrimage site and three mosques. According to an inscription on top of its door, one of the mosques, dates back to the early Safavid period, inside the mosque there is a beautiful nocturnal prayer hall with wooden capital pillars. To have a better view of the village, you can walk towards one of the castles (preferably Takht-e Haman), cross the Barzrud river, and get to the hill-top. That’s where you can watch this breath-taking scenery. All the red clay old houses on top of each other. A 2000-years old civilization that is still standing with minimum changes since then. One of the most interesting things that you can see in Abyaneh, is the beautifully carved wooden doors of most of the houses, AND their door-knockers. If you pay close attention to some of these spectacular doors, you’ll notice that there are a pair of door-knockers on them. One with a long shape, and one with a circular shape, each with a distinct sound. One for male users and one for female users. As you might guess, the long-shaped door-knocker is for male users and the other one for female users. But the reason for this, is that they wanted to know if there’s a male or female knocking on the door, so that a proper person would open the door. If it’s a male, the man of the house would answer the door, and if it’s a female, the woman would do that. And if it’s a man knocking on the door, and the man of the house is not home, woman of the house would know that she has to wear her hijab. Since June 2005, the Village has been undergoing archaeological excavations for the first time, as a result of an agreement between Abyaneh Research Center and ICHHTO’ Archaeology Research Center. Initial archaeological excavations resulted in the discovery of a residential area belonging to the Sassanid era. According to a report released following the visit of UNESCO representatives and experts of world heritage, the historical Village has been recognized appropriate for being registered in list of UNESCO’s World Heritage Sites. However, continuation of hotel constructions has put the status of this historical Village at risk. The recent decision of an investor to erect a hotel in the eastern part of this historic Village has raised the concern of cultural heritage enthusiasts and residents of Abyaneh. How To Get To Abyaneh? From Tehran: book a bus ticket to Natanz, and ask the driver to drop you on Abyaneh road, From there, there are Taxis that take you to Abyaneh. You can book Natanz tickets from Peyke Saba (Taavoni No. 18) bus company in South Terminal in Tehran (Terminal-e Jonub). There are two different departure times for Natanz buses at 6AM and 12:30 PM. The price of Tehran – Natanz tickets is 13500 Tomans. From Esfahan: Book a bus ticket for Kashan, and ask the driver to drop you at Abyaneh Road ( Before purchasing the ticket make sure that the bus crossed from Abyaneh road and not main Highway). From there, there are Taxis that take you to Abyaneh. You can book Kashan tickets from Lavan Noor bus company in Kaveh Terminal in Isfahan. The price of ticket is 10500 Tomans and there are buses to Kashan From 6AM-9PM every hour. Where to Sleep in Abyaneh?